Summer is here and for Las Vegas building owners, this means that one of their most valuable assets is heating up in the desert: their building’s roof. With Las Vegas averaging 310 sunny days per year, and the summer months of June through September averaging nearly 75 days of 100 degree or higher weather, this can have a drastic effect on the life of the roof and its performance to protect the contents within. Commercial building owners looking to protect their roof from the scorching summer heat and premature failure should consider inspecting their roofs now before it gets too hot. UV rays are considered the number one cause of roofing degradation in our climate. Many commercial roofs come with a certain standard warranty — anywhere from 10 to 15 to 20 years. What most warranties don’t take into consideration, though, is the specific nature of the Las Vegas climate and just how hot it gets in the desert. With Las Vegas being an exceptionally hot, dry area, roofing materials break down at a higher rate than in locations like Southern California. On a 60 degree day, a cap sheet roof can register temperatures around 114 degrees, so when outside temperatures reach into the triple digits, that kind of heat can take a devastating toll on a building’s roof. Being able to properly identify where your roof is degrading and catching it early can save commercial property owners from a number of expensive, long-term problems. Inspecting your roof before the full swing of summer hits the area will ensure that it is capable of handling the harsh heat. Whether the inspection is done by a building maintenance staff member or a certified commercial roofing contractor, the inspector should examine both the interior and the exterior of the building every time. ■ Mold on any interior surfaces. ■ Cracks or discoloration of acrylic domes on skylights or smoke vents. If your building’s roof hasn’t been inspected in a while, it’s also recommended to have a plumber check the roof drain lines. This is something that should be done once every few years. ■ How often maintenance is performed. Blank, printable inspection report forms can be found online (one source is http://www.highlandroof.com/commercial-roof-inspection-form.pdf), and using one form for each roof, plus taking photos during each roof inspection, will ensure building management has the most up-to-date, accurate records at all times. Inspecting a commercial roof, especially before the heat of summer is in full swing, is one of the most important preventative maintenance tasks that owners should not overlook. Proper maintenance, especially by those who understand the heat of the Las Vegas climate, should be considered an investment, not an expense, as it can extend a roof’s life and reduces the potential for damage to the building’s interior and its contents. 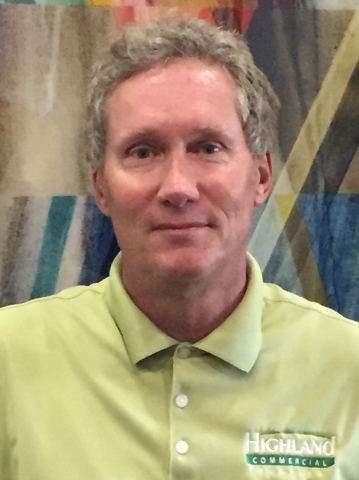 Michael Jackson, a 30-year veteran of the roofing industry, is a senior project manager at Highland Commercial Roofing where he is in charge of all of Southern Nevada. He has been involved in millions of square feet of commercial roofing projects for shopping centers, manufacturing plants, commercial office buildings and industrial spaces.